Mar 3 Should you book a private villa vacation rental over a hotel? My Puerto Vallarta birthday crew. I had the joy of celebrating my big 40th birthday in a private, 10-bedroom villa in Puerto Vallarta, Mexico, with 11 close friends (many of whom I've known for 15 years!). I wouldn't have had it any other way. In fact, when I first started looking at hotels for my birthday week, it felt somewhat.... wrong. 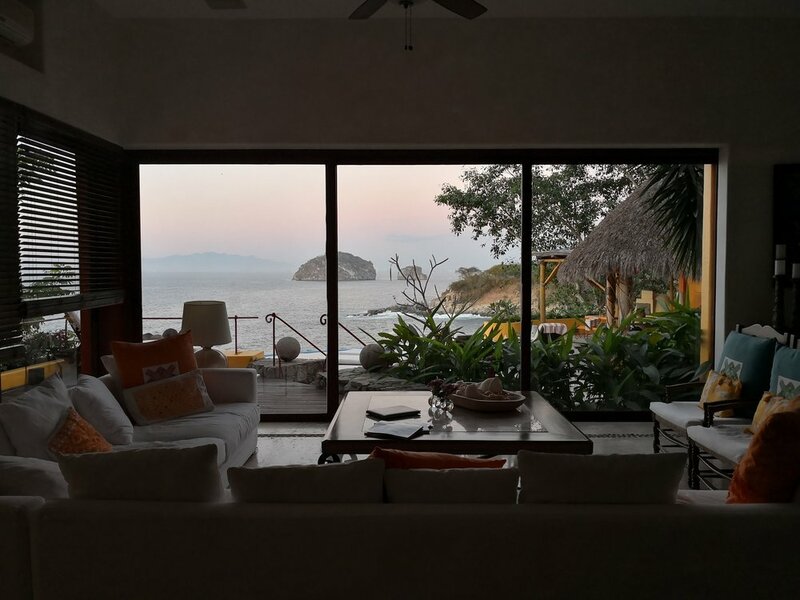 My friends and I are just too close and, despite the fact I primarily shack up in luxury hotels and resorts, I knew I had to be at a private vacation rental (and fate had determined it would be Villa Mandarinas, which was the best experience EVER). To be honest, there's no other way I would have celebrated my birthday. Here are five reasons why you might want to consider a vacation rental over a hotel for a special occasion or big group of travelers. 5 reasons to book a private villa or vacation rental over a hotel or resort! 1. A vacation rental is so much more intimate. When I was scouting for birthday properties, I knew it had to be perfect... and special. I had friends flying in from London, Los Angeles and New York City, friends I don't see that often. I wanted us to be in a space where we could wake up and see each other right away (as in, no walking long hallways, different towers, etc). I also didn't want anyone annoyed with resort woes, like big families sitting in the hot tub, rooms that may have not been luxury enough or staff seemingly everywhere. I wanted a kitchen where we could maybe make our own quesadillas, a private pool where we could catch up and hang and all the other intimate perks you get with a private villa rental. This is us at lunch, being relaxed and casual! 2. I wanted everyone to be completely pampered. Here's something not a lot of people know. When you book a private villa in Puerto Vallarta, you're going to get your own dedicated staff. The staff will include a private chef, housekeeping, a villa manager and even bartender. You don't lift a freaking finger, and it's all included in the rate, which brings me to number 3. Look at the view from our main living room. 3. Vacation rentals are all-inclusive. Not only do you get private staff, your gourmet Mexican food (cooked up by your private chef) is included in the rate. There are no hidden fees or resort fees. ALL cocktails and beverages are included (pre-arranged), as well as WIFI and tips. In many cases, you pay for your food in advance (which the team will stock up on before you arrive) but it's a lot cheaper than eating out. Included in our rate was amazing, home-cooked gourmet Mexican dinners. 4. In a vacation rental, you have tons of privacy and don't have to share resort amenities with strangers. At our private villa, as well as many private villas I've stayed at, you have the beauty of arranging private, ocean-front massages (which are more than half what you'd pay at a resort), have the pool to yourself, recreations to yourself and bar to yourself. It's the perfect set up if you're with an intimate group of friends or family, and there's literally NO STRESS in your vacation. This is just one of TWO pools we had all to ourselves. 5. It's a HELL OF A LOT cheaper. For the five nights at Villa Mandarinas with 11 guests, it worked out to about $360 a night, which is substantially cheaper than the hotels I was looking at (average $500 a night, and NOT all inclusive). It's not rocket science. The beauty of private villas is the high level of value and how you end up saving a lot more money than hotels if you have a larger group. We arranged a ton of special things, like this sunset meditation. IT was all for us! Feb 22 Celebrating my 40th birthday will 11 friends in Puerto Vallarta! !